Large shoulder tread blocks and a continuous central rib gives excellent stability on both straights and on corners. 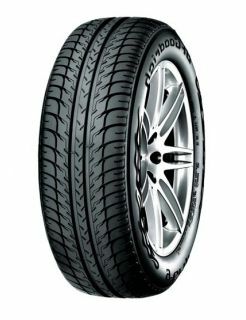 Rapid steering response and superb control is clearly evident when driving on the BFGoodrich g-Grip. Its "chamfered edge" sipes improve the stability of each tread block for better braking on dry roads. Unrivalled driving pleasure is evident on dry surfaces. The g-Grip offers excellent safety on wet roads. A unique, directional tread pattern has been included, which delivers optimum water dispersal in a straight line. The specialist "Vortex" tread pattern controls this dispersal of water, more quickly, for optimum braking and good road holding on corners.